Nerja is the most eastern town on the Costa del Sol in the andalusian province Málaga and 53 Kilometers (33 miles) away from Málaga city. The nightlife in Nerja is rather quiet in comparison to her neighbor cities along the Costa del Sol, as for instance Torremolinos or Marbella; this is due to the attractiveness of the Tourist resort for Families and elderly people, who enjoy their evenings with dining or having a drink in one of the many Restaurants you can find along the beach promenade. Although – in comparison to the wild party life in Torremolinos and Marbella! During the summer months we can find as well in Nerja a lively Nightlife with Music cafés, Bars and Clubs that stay open until the early morning hours. 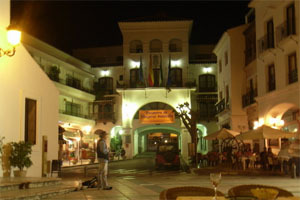 Generally, the actual nightlife in Nerja, referred to Clubs and Discotheques, does not start before 12 o´clock at night. Therefore you might start your tour in the evening with a visit through the numerous Tapas Bars. Some of the best Tapas Bars are located in the area of the old city and the Balcón de Europa, as for instance the Bar La Chispa with the reputation of serving a wide range of scrumptious tapas. The local specialties comprise many seafood dishes and there are a number of excellent Fish restaurants in Nerja. So strengthened you now can proceed to one of the many night bars and Clubs. A great part of Nerja´s nightlife is centered around the square Tutti Frutti and the Street Antonio Millon, with a good and varied offer of Bars in Nerja with Life Music, Flamenco Shows, Irish Pubs, Clubs and nightclubs in Nerja. These places start getting busy from about 12 o´clock onwards and are opened during the main season until 4 o´clock. If your holidays should coincide with one of Nerja’s mayor festivities then you can together with the locals dive into music, dance and Street Parades. One of the mayor Fairs takes place in October, during 4 days of "Feria", with fairground rides and plenty of life in the streets. The people of Nerja love to celebrate and party, especially during this annual Nerja Festival. Apart from the nightlife as such, Nerja has to offer an ample range of activities for every liking; in the area there are festivals throughout the year, such as ballet, Flamenco, Theatre, Music or Classical Dance. Open daily from 8pm until 2am. Closed on Sunday. Theme parties, DJ and music of all kinds. It opens on Fridays and Saturdays from midnight to 7 am. Tutti Frutti Square is a fantastic place to drink some cocktails and have some fun at night in Nerja. Near Burriana beach, this snack bar open during the day and offers cocktails at night. There is free WI-FI connection available. Open daily from 1pm until 2am. Good cocktails next to Torrecilla beach. Open daily from 11am until 2am. Perfect place to drink a glass of wine. Daily from 1 to 4pm and from 7pm to 2am. Open daily from 10:30am to 3am. Fridays and Saturdays until 4am. Good cocktails near Nerja Museum. Open daily from 11am until 3am. Tuesday open from 9pm. Near Burriana beach, this snack bar open during the day and offers cocktails at night and live music. There is free WI-FI connection available. Open daily from 7am to 3:30am. Closed on Mondays. In Nerja, near the 'Balcon de Europa', you will find the pub-restaurant with international cuisine and a terrace with sea views. Open daily from 11am until 12am. Good cocktails near Chaparil square. Open daily from 12pm until 1:30am.